MIRACLE MILE venue events are featured Sat., Dec. 5 through Mon., Dec. 7. The museum opens to the public, Sun., Dec. 6. 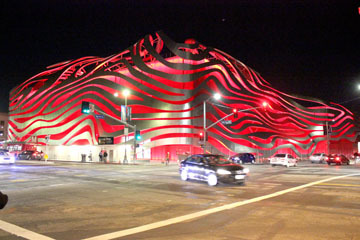 Love it or hate it, it’s hard to miss the new Petersen Automotive Museum. Racy metal ribbons encircle the red exterior walls at the corner of Wilshire Blvd. and Fairfax Ave.
Exhibits inside show off sports cars and legendary models, plus the latest in automotive technology. Visitors can get behind the wheel of racing simulators and explore the Disney/Pixar “Cars” exhibit. The 13-month, $125 million renovation transformed the 20-year-old museum inside and out. Its 95,000 square feet of exhibit space on three floors is devoted to the history, industry and art of the automobile. 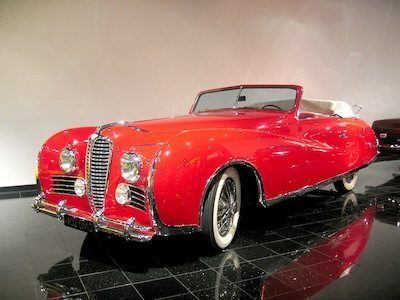 RANKED AMONG the most sophisticated automobiles of its time, the Delahaye is among cars on exhibit. The grand re-opening gala is Sat., Dec. 5 with tickets starting at $1,500 per person. Limited admission is open on preview day Sun., Dec. 6. Tickets are $200. The museum opens to the general public on Mon., Dec. 7; hours are 10 a.m. to 6 p.m. Tickets are $15 adults, $12 seniors and students. Children pay $7 and under 2 are free. Parking under the museum is free the first 30 minutes and a $12 fee after. Bicycles park free. Visit the metro trip planner for bus and rail transportation. For more information visit Petersen.org.